"I'm not such a bad pilot myself." Order your own copy of these X-Wing Second Edition expansions at your local retailer or online through our website today! There’s no telling what you’ll come up against in the thrilling space battles of the Star Wars™ galaxy. Whether you’re launching a quick strike against sensitive Imperial targets, sending waves of TIE/ln fighters to quell any resistance, or tracking your next bounty through deep space, having the right combination of ships and equipment can make all the difference. Fortunately, a full complement of starfighters is at the ready. Taking on a force like the Galactic Empire is a nearly impossible task, and the Rebel Alliance needs every starfighter it can find if it wants to continue the fight for freedom. Luckily, the Rebel Alliance Conversion Kit gives you access to a full complement of Rebel ships right away. 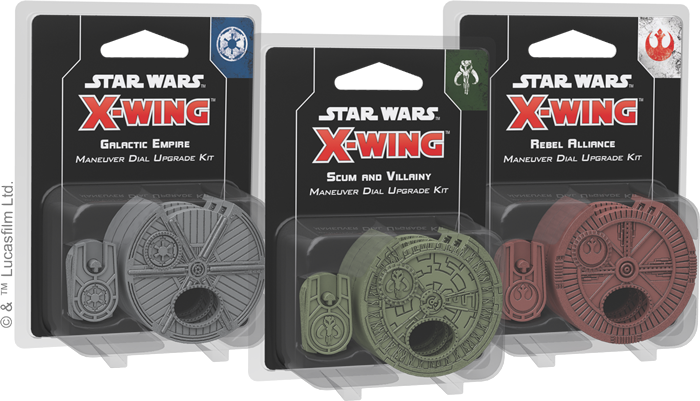 The conversion kit contains all the ship cards, tokens, upgrade cards, and maneuver dials that veteran players need to upgrade their existing Rebel Alliance ship collection to X-Wing Second Edition. Alternatively, new players looking to experiment with ships beyond those available at launch can combine the components found in this Conversion Kit with first edition expansions to gain access to even more ships, like the blazingly fast RZ-1 A-wing or the iconic Millennium Falcon, from day one! The Rebel Alliance might not be able to match the sheer number of starfighters fielded by the Empire, but they can counter with one of the most effective starfighters in the galaxy. With a fine balance of speed, maneuverability, and firepower, the T-65 X-wing is more than a match for anything the Empire can throw at it. 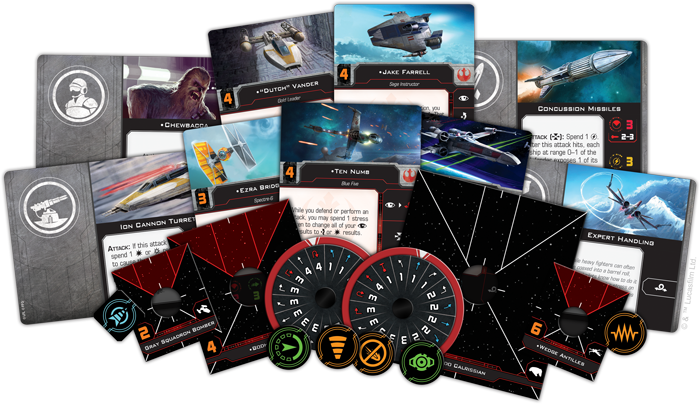 The T-65 X-Wing Expansion Pack features a beautifully painted T-65 X-wing miniature as well as all the cards and tokens you need to play. A mainstay of Rebel fighter squadrons, the T-65 X-wing can play a part in virtually every Rebel operation, and every Rebel pilot will appreciate the extensive range of customization options available to the ship. These iconic starfighters can be outfitted with a variety of torpedoes, astromechs, and modifications that enhance their abilities and make them all the more effective. But perhaps the most striking feature of the T-65 are its Servomotor S-foils. Pilots can open or close these moveable wings before they activate to grant the ship an added burst of speed or a little firepower, giving you the freedom to choose the best configuration for the situation. 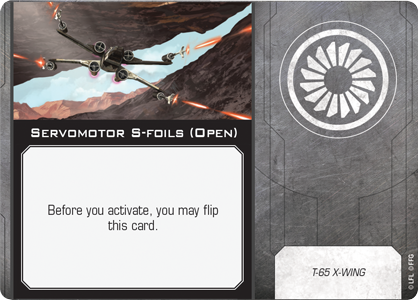 For a full preview of the T-65 X-wing, including the pilots who fly it, click here! While the Empire has the resources and pilots to field squadrons containing a large number of starfighters, the Rebels are left scrounging for whatever ships they can find. The dependable BTL-A4 Y-wing, then, is a boon for squadrons in need of its heavy armament. Within the BTL-A4 Y-Wing Expansion Pack, you’ll find one fully assembled, beautifully painted and resculpted BTL-A4 Y-wing miniature to add to your Rebel squadron, along with several upgrade cards that you can use to unlock the ship’s full potential. Although slower and more lumbering than the T-65 X-wing, the Y-wing can carry some munitions capable of causing some massive damage. The ship can be loaded with a range of devices that can be dropped into the path of enemy ships and, thanks to its ability to take the reload action, the Y-wing can refresh its supply of these munitions. 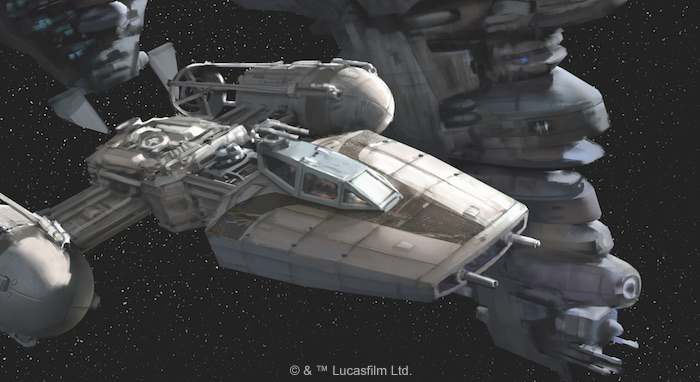 To further counter its low maneuverability, the Y-wing can also add a turret weapon and gunner to return fire in any direction, no matter which direction the Y-wing is flying. 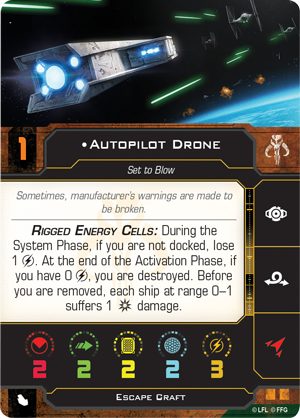 For a full preview of the BTL-A4 Y-wing, including its many upgrade cards, click here. In the space battles of the Galactic Civil War, the Galactic Empire can call upon a whole host of starfighters to quell any resistance. Now, the full might of the Imperial Navy can be at your command from the very beginning of X-Wing Second Edition. With the Galactic Empire Conversion Kit, you can bring your entire fleet of Imperial ships from the first edition into the second edition, allowing you to add powerful ships like the TIE/D Defender or the stealthy TIE/ph Phantom to your Imperial squadrons as soon as you start playing. 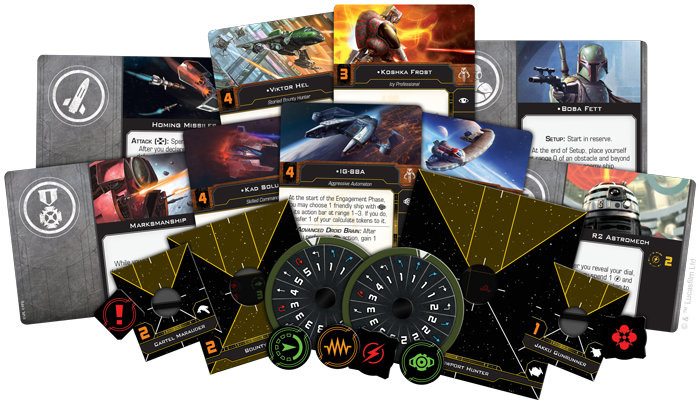 On the other hand, if you’re a new player, you can use the ship cards, tokens, maneuver dials, and more than 100 upgrade cards found in this conversion kit together with first edition ship expansions to grow the possibilities for your X-Wing Second Edition squadrons. With the vast resources at its command, the Empire has created some of the most advanced starfighters in the galaxy. For its standard-issue starfighter, however, it has chosen to press its numerical advantage and crush the Rebellion under the weight of swarms of TIE/ln fighters. 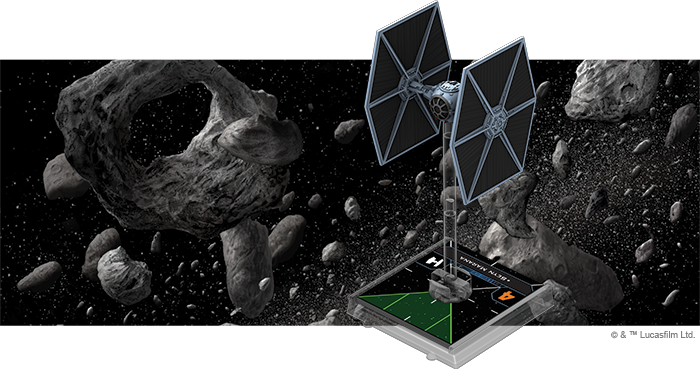 The TIE/ln Fighter Expansion Pack contains one beautifully painted TIE/ln miniature alongside all the components you need to add it to your Imperial squadron. Cheap and highly maneuverable, the TIE/ln is the perfect option for filling out your Imperial squadron. The TIE/ln may lack the shields and heavy firepower of its Rebel counterparts, but it more than makes up for these shortcomings with superior speed and maneuverability. Sporting three agility, this ship can easy dodge any incoming fire. What’s more, although a single TIE/ln fighter only has two primary attack, a large attack group can rain fire down on an enemy ship in a devastating concentrated attack. 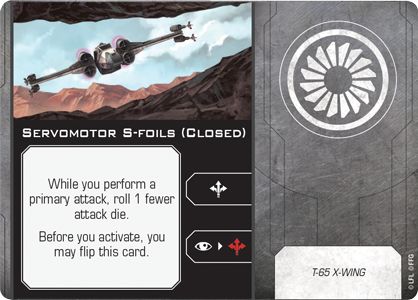 For a full preview of the TIE/ln Fighter Expansion Pack, including its array of available pilots, click here! Wave after wave of TIE/ln fighters are usually all it takes to eliminate opposition to Imperial order. Sometimes, however, cheap, expendable starfighters aren’t enough to handle the problem. During those times, the TIE Advanced x1 is more than enough to convince any remaining Rebels to abandon the cause. Within the TIE Advanced x1 Expansion Pack, you’ll find a beautifully painted TIE Advanced x1 miniature as well as the cards and tokens you need to add this new ship to your squadron. Much more durable than the TIE/ln, the TIE Advanced x1 also makes your squadron that much more deadly. Already enhanced by an onboard Advanced Targeting Computer, the TIE Advanced can also equip a number of upgrades not available to the TIE/ln, including missiles and various System upgrades. The ship becomes truly frightening when Darth Vader is at the controls, using the power of the Force to take additional actions and set up a powerful attack. 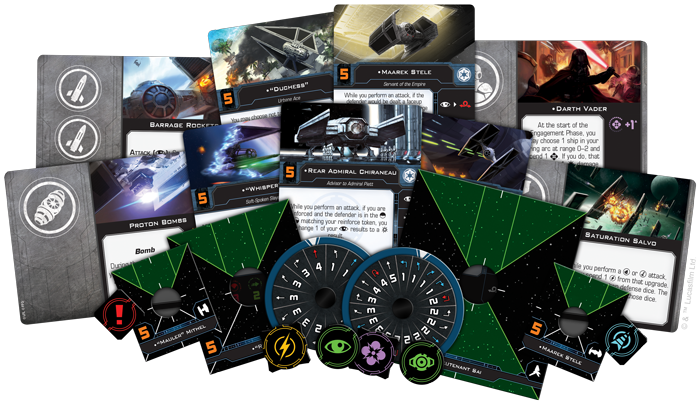 For a full preview of the TIE Advanced x1 Expansion Pack, including a look at the dreaded Darth Vader himself, click here! While the Empire and Rebellion are mired in their ideological conflict, the galaxy’s seedy underbelly searches for ways to serve their own interests. Unlike the uniform military vehicles of the other two factions, the infamous bounty hunters and criminals that make up the galaxy’s Scum and Villainy pilot a diverse array of highly customized ships and the Scum and Villainy Conversion Kit gives you the chance to bring all these ships to your games of X-Wing Second Edition from launch. With the full hangar bay of new ship cards, tokens, upgrade cards, and maneuver dials you’ll find in the Scum and Villainy Conversion Kit, you can upgrade your Scum ship collection from the first edition to the second edition, bringing iconic pilots like Boba Fett and Fenn Rau into the game right at the start. If you’re a new player looking to fly notorious ships like the IG-2000 or the Punishing One, you can also use this kit along with first edition ship expansions to round out your X-Wing Second Edition squadrons. The Millennium Falcon is one of the most iconic ships from the entire Star Wars saga. But long before Han Solo was piloting it as a member of the Rebel Alliance, it belonged to the notorious gambler and smuggler Lando Calrissian. You can experience this classic ship in a whole new way by adding it to your Scum and Villainy squadrons with the Lando’s Millennium Falcon Expansion Pack. This expansion contains a fully assembled and pre-painted customized YT-1300 light freighter miniature, as well as all the components you need to incorporate the ship into your Scum squadron and outfit it for battle. The Millennium Falcon may have been built to haul cargo, but that doesn’t mean it’s not effective in a fight. The ship sports a double turret arc, allowing it to cover a wide swath of space with its primary weapon. More importantly, the ship’s detachable Escape Craft lends it even more flexibility. While docked, this ship lends its shields and pilot abilities to the Falcon. But, if the situation is dire, it can also be flown on its own, working alongside the rest of your squadron. It can even equipped with Rigged Energy Cells and flown by an Autopilot Drone directly into an incoming group of enemy fighters for an explosive surprise! For a full preview of the Lando's Millennium Falcon Expansion Pack, including a look at the pilots for both the Falcon and the Escape Craft, click here! Although it was originally produced for law enforcement purposes, the Firespray-class patrol craft is also a favorite of pirates and some of the best bounty hunters in the galaxy, including the infamous Boba Fett. Attracted by a robust chassis that can be packed full of countless deadly armaments, every pilot puts their own spin on this highly customizable craft. The Slave I Expansion Pack contains a beautifully detailed Firespray-class patrol craft miniature alongside all the ship cards, tokens, upgrade cards, and maneuver dial you need to outfit your ship and begin the hunt. Without any upgrades, the Firespray-class patrol craft still offers a powerful ship that rolls three attack dice from both its front and back arc. But the ship truly shines when you begin adding upgrades. It can be modified with cannons, missiles, devices, crew members, and illicit upgrades for a stunning array of tactical possibilities. What’s more, this expansion pack also includes three Title upgrades that unlock even more abilities, actions, and customization options. For a full preview of the Slave I Expansion Pack, including a look at all its upgrade options, click here! The warriors of Mandalore crave the glory of battle, and this desire only grows stronger when they take to space. Fortunately, their signature starfighter, the Concord Dawn Protectorate Fang Fighter, helps them maintain their confrontational style in the high-stakes dogfights of X-Wing Second Ediition. 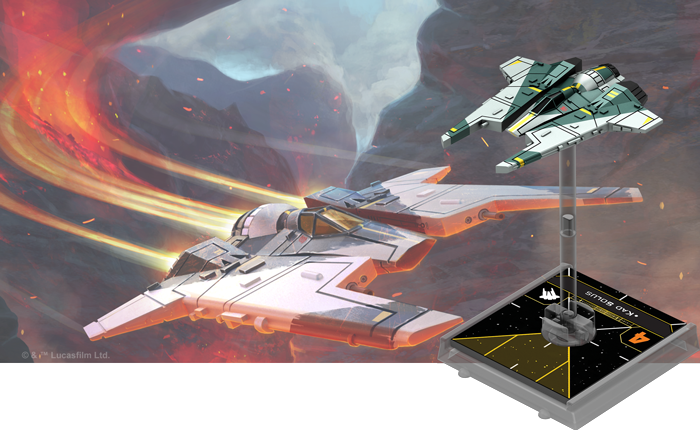 The Fang Fighter Expansion Pack contains a beautifully painted Fang Fighter miniature, featuring posable wings, alongside everything you need to add one of these nimble fighters to your Scum squadron. The Fang Fighter’s advanced pivot wing technology grants it unmatched agility, making it an exceptionally difficult ship to hit. This added maneuverability is tempered by the ship’s lack of deflector shields, but this doesn’t deter Fang Fighter pilots’ aggression in their relentless pursuit of their quarry. In fact, all Fang Fighter pilots are expected to master the bold Concordia Faceoff maneuver, leveraging their ships’ narrow attack profile to execute deadly head-on charges. 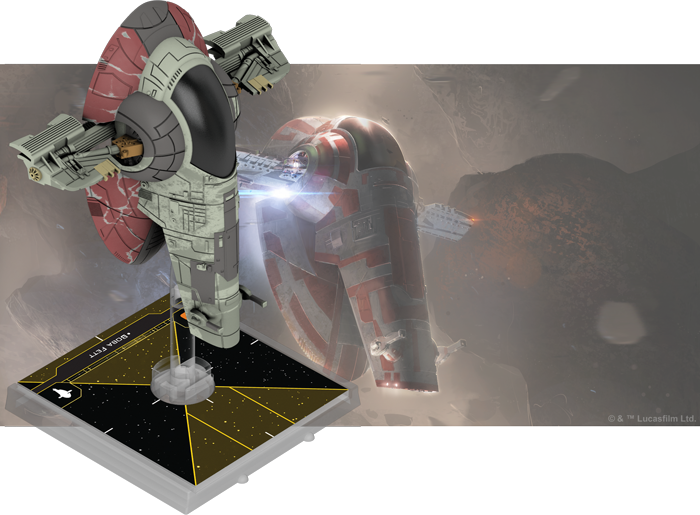 For a full preview of the Fang Fighter Expansion Pack, including a look at the Concordia Faceoff, click here! Plotting your maneuvers is a central part of your strategy in X-Wing Second Edition, and every type of ship features its own unique maneuver dial. With three distinct factions and ships from across the Star Wars saga to choose from, you can make your squadron even more distinct with the Maneuver Dial Upgrade Kits for each faction. These upgraded plastic maneuver dials proudly declare your allegiance to the faction of your choice while enhancing the aesthetic look of your squadron. As you secretly plot your maneuvers each round, these kits house a ship’s dial within a secure plastic housing. Additionally, the kits include a space on the back to insert a dial ID token, making it easy to differentiate between your ships in the middle of a game. 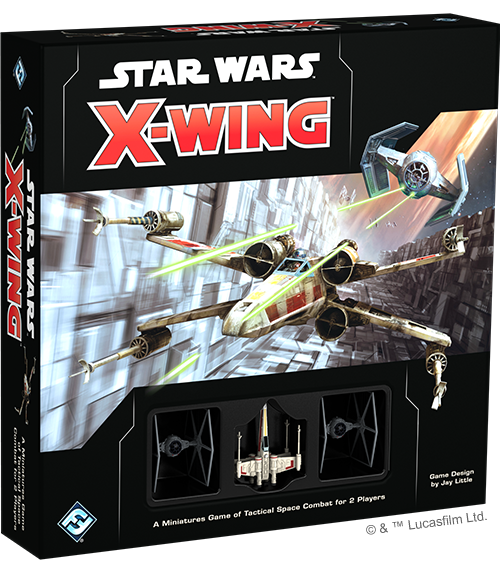 With the release of X-Wing Second Edition, a new era of space combat and some of the most iconic starfighters from across the Star Wars saga are at your fingertips. It's time to pick your pilots, outfit your ships, and enter the fight. Supplement your squadrons with the first round of expansions for X-Wing Second Edition, available now from your local retailer or our website!